It’s time to get Bridget to a vet. Several days have passed since she spun out and hurt her back leg. I’m seeing very little progress. The pain medicine keeps her happy, but she’s only using the back leg for balance, not bearing any weight. We leave Panther Flat and continue northeasterly toward Grants Pass. It’s the closest town of any size on our route toward Crater Lake. I choose a vet at random. Grants Pass turns out to be bigger than I anticipated and finding the clinic is difficult, to say the least. Heavy traffic, five-point intersections, one-way streets, errgh! I pull over and set up my Garmin GPS with the clinic’s address. I apologize to Miss Garmin. A while back a reader asked me if I had any regrets or things I would do differently. I replied that I really didn’t need the GPS. I’ve done quite well without it. Such arrogance! Well, I eat those words today, Miss Garmin . . . . Your voice is music to my ears! She maneuvers the PTV/BLT through the hectic maze to the vet clinic. I’m thankful to see there’s parking in the back, big enough to accomodate both the PTV and the BTV with room to turn around. The names of six doctors are on the door. All the time I’ve got a worry in the back of my head about Spike outside in the PTV. After the bill is paid, I hurry out to the PTV with Bridget in my arms. Spike is fine, happy to see us, and also happy to relieve himself on a bush before we once again place ourselves under the control of Miss Garmin. Now we’re in the throes of lunch hour traffic. At a busy intersection we stop at a red light. A guy in front of us in the lane to the left jumps out of his SUV cursing mightily. Oh no, road rage. Please don’t have a gun. He slams his door and charges back toward us and… whew! . . . past us, shouting “YOU GOTTA PROBLEM WITH ME? HUH? YOU . . .(curse word involving a mother)! NOT SO SMART NOW, ARE YOU, YOU LOUSY . . . (curse word involving a son)! The calm tones of Miss Garmin instruct me to drive straight for sixteen miles before turning onto Highway 62. Ain’t that good news! I’m outta here! 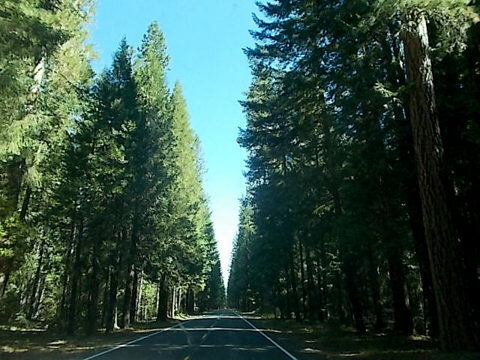 A scenic drive leads us to Natural Bridge Campground, a national forest campground north of the tiny village of Prospect. The fee is $10 a night or $5 with the Senior Pass. 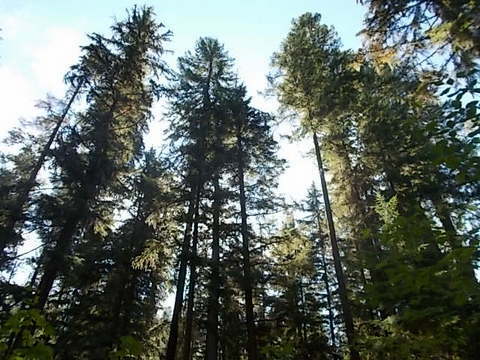 I discover our site has some sun, and some shade under very tall, old growth fir trees. 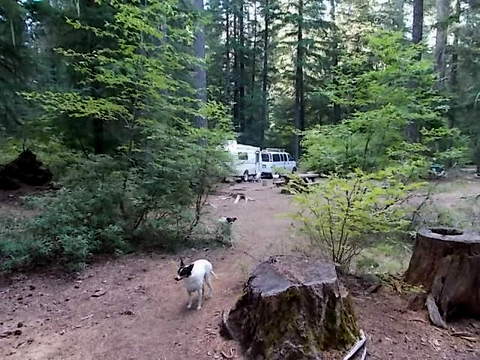 Campers in neighboring campsites can’t be seen because they’re so far away and the vegetation is so lush. 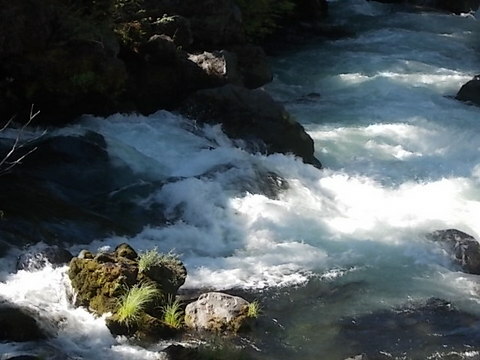 To top it all off, the glorious Upper Rogue River rushes past our backyard! 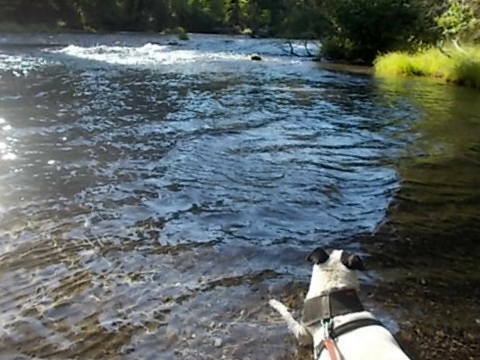 Spike soaking in the Rogue River behind our campsite. Later the crew and I explore the natural bridge of the Rogue. 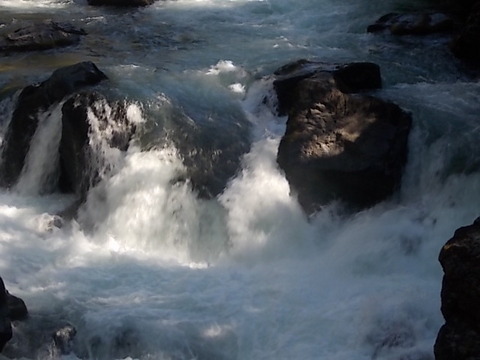 The clear water of the river disappears underground and appears again further downstream in pure, frothing, white energy, tumbling and crashing over the rocks and anything else in its path. Bridget, Spike and I watch spellbound from the bridge. Quite a sight, quite a sound, quite a river. The Rogue. How I dreamt about camping alongside you someday! This entry was posted in Simple living and tagged fulltiming, Grants Pass, ligament, Natural Bridge, Oregon, road rage, Rogue River, RVing, vet. Bookmark the permalink. Hi Julie… I won’t be in Klamath Falls before Friday. We haven’t experienced any smoke in Oregon. I wonder where the fires are. I’ll have to check that website that gives fire locations and updates. I am, Page. Thank you! So what is the prognosis for Bridget, Just pain pills and rest, I hope. For now, yes. But it looks like surgery is in her near future. I thought I had a place lined up for it to take place, but the specialist is on vacation. I don’t want to get ahead of my blog here… LOL. To Sue: Beautiful part of the state and your timing there is great, not crowded(except cities), weather good. Chuck. To the Hound Herd… All she needs to do for now is relax and enjoy the stroller rides. Hi RVSue&Crew, Love the photos, story line and all the comments. My vet told me to wait on a cat with ACL and the cat healed fine; so I would advise wait and see, a couple more weeks anyway. If you decide to sit send a address. I keep hearing different things… must have surgery or wait and it’ll heal. Is there a difference between ACL and the “cranial cruciate ligament?” One vet says it will never heal on its own. Another is more vague about it. We’re told she doesn’t have to hurry… That we can wait and see what anti-inflammatory meds and rest will do. I hate not knowing! I saw my cat, Too, get hurt and it happened just like Bridget; chasing another animal. ANOTHER beautiful campground!!! I sure hope one of your readers can recommend a vet for Bridget somewhere along your planned route back to AZ/NM for the winter. The one is TorC is just ok…. no real recommendations from me! I sure wish my Florida vet could do it, he is fantastic!Keep on smiling Bridget….. life will get better!!! Your mom is taking very good care of you!!! Bill and Ann have a recommendation for a vet. I’ll keep you posted. Well, we can pray that little Bridget heals in record time!! That is an awful lot to put out at one time. Though, of course, how can you not. I am so glad you are having her seen. Brave little trooper!! We may have found our next landing spot for a time…up in Virginia. Still keeping the RV idea in the back of our mind. A friend tonight told me of one for sale that we might go see anyway. So you’re moving to VA? Yes, Bridget has been a brave little girl through all of this. Yes, for about 6 months anyway…then off to Seattle to help out daughter for awhile with new baby coming….then??? We have dreams…but we shall see what comes to be…flexible is the name of the game, eh? Enjoying the retirement anyway!! Had problems the past few time leaving comments. Guess they weren’t important cause they didn’t stick. Poor little sweet Bridget, I hope she mends soon. That river looks scary, but you know maybe Bridget could use a little water therapy? Do you think a brace on her leg would help her some? I have heard of vets doing this sometime. Anyway, looks like you found another great spot how you can stay for a while and regroup. $5 a night isn’t bad at all. Hope it is enough sun to power you up. Enjoy! For some unknown reason several comments were held for moderation. And since I have to drive to Prospect to get internet, I didn’t see them until this afternoon. I’m sorry about that. I answered your questions after your comment that I approved and should be below my previous blog entry. Again, sorry… WordPress must be mad at me. It wouldn’t let me make a slideshow today. $5 a night is great! And we have sun! Sounds like you’ve had your hands full for a few days. I’m with Page on the decompression. We’re home for a couple of weeks so if you have some expenses to post I can add them to the spreadsheet – but no rush. With Bridget’s injury, I bet you’re really glad you got a lot of free camping last winter. Hopefully by now she’s feeling better. We’ll say a prayer for her cause I know God cares about ALL our loved ones. Bridget in the stroller looked really cute and I know she’s more comfortable and enjoys seeing the sights. FYI, your entry into California had me in stitches. You are a GREAT writer. I could just picture the situation. Thanks, Reine. I’m behind on reporting expenses. It’s difficult keeping up with everything when I have to drive for internet and do my writing in the PTV with the crew. I’m sure you understand. I’m keeping all receipts so I’ll catch up soon. For some reason my cheapo word processing program is persnickety and practically useless, so all writing has to be done online. If waiting won’t cause any more damage to Bridget’s leg I guess there’s no harm in waiting to see if R & R helps. It seems as though the pain meds keep her comfortable and she certainly seems to have adapted well to being pushed around in the stroller. As with any medical challenge it often helps to have a few opinions. If surgery is needed it would be great if you can arrange it with a recommended vet rather than choosing one that just happens to be close. I wish you and Bridget well with her recovery and please tell Spike we haven’t forgotten about him even though Bridget has taken the spotlight. I was told that waiting would be okay. Thanks for the good wishes, Barrie. Becky’s (if the cafe is still there) in Prospect is known for its huckleberry pies! Did you find it? I hope the midges in Klamath Falls don’t hitchhike in your BLT. The little green bugs sometimes “drift” on front porches and like to fill the inside of your RV. Save travels! Spent 2.5 years at Crater Lake and 10 years in K.Falls. Oh, how tempting… Huckleberry pie… or any kind of pie for that matter! No midges so far… We don’t even have mosquitoes. I will be stopping at the Gorge. Hope you get some cooling in Tucson. Gorgeous pics once again. 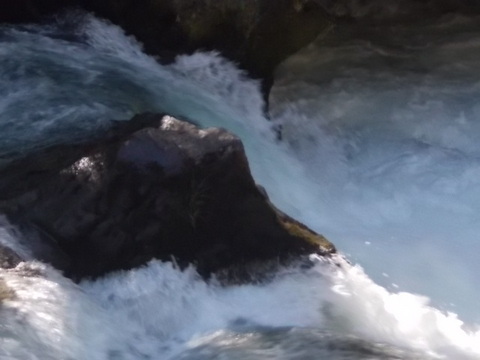 The river disappears underground and then reappears frothing, white energy crashing……sounds breathtaking! Relax and recoup. That senior rate/pass is really coming in handy. Is it actually a pass or do you have to show ID? Glad to hear Bridget was a trooper. She may be a bit sore tonight from the manipulations and the dampness of the west coast. Spikey was a good boy too and probably was worried about his best friend. I’m sure he didn’t take his eye off the front door of the vets. PS: Tornado watch tonight………..What’s up with tornadoes in upstate NY?? I’d stayed and dealt with the earthquakes in Caleefornia …..had I’d known! Tornadoes in upstate NY? Hurricanes maybe … That’s weird. That’s what I said!!! We usually get the tail winds of the hurricanes..Irene was pretty bad, Issac was less destructive. This was a tornado watch…..winds were gusting at 60mph. The weatherman didn’t like the swirl of the band of clouds. Been reading the comments and somebody beat me to recommending Becky’s Cafe, so I’ll second it 🙂 The pies are amazing! We stayed in Prospect a few years ago as a base for Crater Lake. It was late June and there was still a good amount of snow around Crater, so Prospect was a great little place to hang out. Checked out Diamond Lake while we were there but the mosquitoes were horrible, so we moved on. Hope Bridget’s ligament heals up, even if it’s a long shot,that would surely be best for all of you. Hi Marcia… We’ve been to Crater Lake. If I can get WordPress to show a slideshow, I’ll post photos of the bluest lake I’ve ever seen. I’m typing this while with the crew in the PTV outside the library, soaking up WiFi. I know Becky’s Cafe must be close by but I’m trying not to look for it. One of my concerns about going full-time is finding competent medical care for me and my sweet dog on the road, should medical care be necessary. Being at the mercy of whoever’s available — and risking the possibility it will it turn out to be someone who favors a good bleeding to treat various ailments — doesn’t appeal to me all that much. I hope that doesn’t keep you from the full-time life. You are now in my favorite part of Oregon. I don’t believe that there really is a bad part of Oregon, just different parts of it that will take your breath away. I think if the campgrounds had electric and sewer/water I might just winter there. Safe journey, I will see you out there sometime in the future. From what I’ve seen of Oregon, I agree with you, Bee. It’s all good! Beautiful scenery!! Years ago (back in the 70’s) I visited my dad’s aunt in Grants Pass and we took a trip to a cute little town called Jacksonville. A tourist spot, but it was so much fun. Felt like i was back in time. It’s between Grants Pass and Medford. I didn’t go that way, so I didn’t see it. Yes, the scenery here (even on small scale, such as looking at foliage) is beautiful. Another fabulous campsite at a great price which will put money in the surgery fund. You continue to amaze with these gems! Glad your garmin came through for you. Mine is banished to the basement compartment for leading me astray too many times . I know what you mean about the garmin … I’ll never forget Coyote Road in NM. However, it saved the day in Grants Pass. I’ll use it as a last resort. Happy you approve of my campsite choices! Your description of the road rage person had me chuckling. So glad you were not the culprit! Hoping for the right decision for Bridget. It is very confusing, isn’t it? Afterward I thought about the road rage guy and it made me sad for all the people who are trying to cope with city life and hating it. I could feel the tension even before the incident. RvSue, have you considered publishing your adventures or have you already mentioned that you would? With some more details (when you have time) it would make for great reading! Food for thought…from a fellow writer! I’m flattered that you think I should publish. Right now I’m having too much fun to do anything that might require some work! I’d just as soon offer my little stories here. Thanks for the thought. I’m on vacation now, heading to NM, up through. but just wanted to share with you about one of my pups. She had a tendon tear problem, which sounded a LOT like what you are saying. My vet said he would LIKE to give the pup’s body (she is 10) a chance to heal itself, but explained that he didn’t know if both the pup (Lilly) and I could/would so it, because lots of his pup patients and the pup parents felt ‘sorry’ for the dog, and didn’t ‘follow instructions’, so that surgery was usually the ‘surest’ option. ……….but if I wanted to, I could try it. He had Miss Lilly ONLY allowed to walk when needing to potty, and not allowed to ‘sniff’ around first. She had to stay/sleep in a crate that was longer than wide, so that she didn’t move about too much, and to give the leg as much immobility as possible. He splinted/caste the leg, booted it, and she had to either be ‘held’, carried, or crated, and I was not to take her outside to potty until I knew she was almost ‘desperate’ so that she would do her ‘duty’ asap, and not try to wander & sniff around. I did as he asked/suggested, and although she took SOME meds, she didn’t take enough to cause her to want to ‘bear weight’ on her bad leg. So basically, I carried her, even out for her ‘duty’, held her in the evenings so she could ‘stretch’ in my lap, but I kept that leg off the floor for almost 4 weeks, and although I felt sorry for Lilly, I was trying to avoid the surgery. I got a crate that was barely big enough for her to lay down in, and not tall enough for her to stand up in, and kept her there. I dropped treats in to her through out the day, brought her different chew toys, and ”held” her in my lap or arms several times a day, even laying her on the floor for tummy rubs and body massages for extra attention, etc. She did really well, seming to know that she HAD to give it a chane to heal, ……………..and it did!!! I’m no expert, …………but Lilly has recovered twice now, once with her leg, and another time with her back. If you think you and the pups could LIVE with one of them ‘in a cast, and in a too-small crate for 3 weeks, you might talk to the vet. Best Wishes!!! I appreciate you explaining the experience you had with your Lilly. Part of me wants to go that route. Surgery is not without its dangers and Bridget is terrified when separated from me for any length of time. I tend to be a less-is-more kind of person, even with medical issues. Thanks for the input and best wishes. Hi Sue, I am kinda knew to your adventure but feel I know you and the crew like old friends. I am 75 and spent a lot of my earlier life camping too. I did it all. Tent’s, trailers, Motor-homes camped all over from the beaches of Baja California to Canada and dearly loved the adventure. Much of that time my traveling pals (other than my wife) were my two little cats, Annie and Christopher (both gone now but remain in my heart and mind)….great little travelers. I really enjoy your adventure and being allowed to ride along with you guys. I do worry about Bridget and hope that works out in a positive way. I guess a soft cast to kind of support her won’t work huh? I suppose you have explored that. I just wondered if partially mobilizing it wouldn’t help it heal (if healing without surgery is possible). Welcome to my blog, Jim, and I’m sending you an early birthday wish… I hope you have a wonderful celebration and a great year ahead. I’m honored to have such an experienced camper find my blog interesting! I love following your posts. Today’s pictures are just beautiful! Thank you for sharing. And thank you, Cathy, for your kind words. It makes me happy to hear you love my posts. Love Natural Bridges, Becky’s and the Rogue River Gorge. Actually, that whole part of Oregon is breathtaking. Sure hope Bridget can heal without surgery. Wouldn’t it be great if she didn’t need surgery? I don’t really care about the cost. I’d rather she not have to go through it. What a beautiful campsite! I think if I arrived there, I would never leave. I feel the same way, Neita. Hi Sue, if your friends haven’t already located one, there is a Board Certified Vet surgeon located in Medford, about an hour south of you on Hwy 62. His name is Dr. Steven Ferreira and he works at the Southern Oregon Vet Speciality Center. Since Bridget is a smaller “love puppy” she should do fine with what they call a traditional repair. Enjoy that area of the world, safe travels and Scritches for the crew and most of all you! A little less drama would be nice, I’m sure! I appreciate the recommendation. Yes, less drama would be good. Hi Sue! I stopped reading for a while… life got in the way… and now I am back to read that little Bridget hurt herself 😦 I do not have any advice nor recommendation. But I send the 3 of you lots of good wishes, and more for Bridget. This must be touch on her and I hope she understands that all will be OK soon. Even if this involves a surgery. You are taking great care of her. Such a beautiful area where you are staying right now. Feels nice, cool and quiet. How nice of you to say I’m taking great care of Bridget. I feel so uncertain about the whole situation. Yes, this area is wonderful. I could spend a whole summer here and want to come back again. Well I’ll be jiggered. This is the first time I’ve posted to your blog and not had it appear. Did it on my phone for the first time too. Lesson learned. I ADORE seeing your beautiful campsites. You seem to find them every where you go. This one is fantastic. I can hear that river. Camped along its banks is just where I’d love to be too. But I might have a very hard time leaving. Glad you have been able to find such inexpensive but gorgeous places to camp….more money for the surgery fund. A huge to all 3 of you from me! Some day in person. Sorry to hear about Bridget. We’ve had some major ops on our pets and I know how tough that is (emotionally AND financially). By the way if you’re coming to Crater Lake I highly recommend staying at Diamond Lake National Forest Campground. That’s where we are right now and it’s a lovely spot with some gorgeous lake-side campsites. Our big rig could only fit a few spots, but you’ll be able to get into all of them. It’s $16/night ($8 with senior pass).I have pics on the blog if you’re interested. I’m curious about Diamond Lake, so I appreciate you writing about it. I love where we are right now, so I’m not thinking much about different campgrounds. Bridget’s care will determine where we go. Looks as if you had another wonderful day… productive for Bridget as well. The pics are awesomely beautiful as always, your blog just makes my day… in the most wonderful way, thank you! 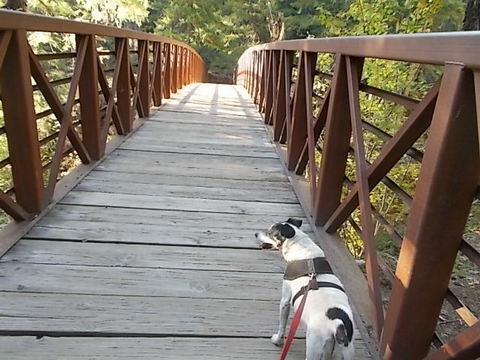 One question for you, hope you can remember… the harnesses that Spike and the Bridge wear? The info on the harnesses is on the Readers RVing Resources page (at the top of blog). I bought two more so I could have a harness on Bridget and Spike while the others were being washed. The new harnesses are Puppia brand. I bought them at a pet store, one of the national stores, can’t remember which one. Most pet stores stock the tiny sizes in the color pink. Just be careful if you order online as they tend to run small. The crew wears the large size, to give you an idea. They are always totally busy with standing room only, but they are always accommodating anyone with special circumstances. Hi Laurie… We went to All Creatures for the second opinion! we did it and he healed just like new. For a month or so he had to be in a confined area. Just check out the surgeon vet best you can. It will all work out…a prayer helps! Thanks, Linda, for weighing in on the question of what to do about Bridget. So glad you are enjoying the gorgeous PAC NW. As a Washingtonian who spent 25 years in OR, it is a good place to be! But where are you wintering? I bet it comes on us like a shot this year–it has been so clear for so long! Stay safe!!! I’ll go back to Arizona, Barb. I really enjoyed it last winter. Hey Bridget, just wanted to tell you that I am sending you good thoughts. Rest assured your mom will make the very best decision concerning your well being, and hopefully your leg will be feeling much better sooner than you think. Take care little one. On behalf of the little patient, thanks for your caring message. Weather cooling in upper Mimbres Vally, have BLM coser to Gila but we’re only $20. a nite, full hookups….Warmer in Tor C but dinner at Groovys for 2 night, full hookups…..Looking forward to seeing ya’……..City Of Rocks 25 minutes in lower Mimbres Valley…..Keep the herd posted on Brigdet, they are concerned. Thanks, Niss you kids!!! I don’t imagine it took you two long to get yourselves sitting at a table at the Gritz. Don’t blame you none . . .